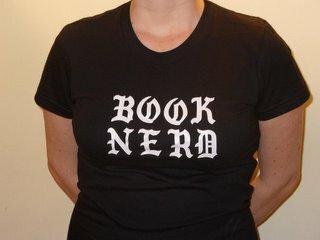 Apologies, Written Nerd readers: there's been a distinct lack of posting around here. I blame the truly frenzied level of real-ness which the bookstore project is approaching. More details and announcements as soon as I'm able, I promise. In the meantime, since I have no attention span, here's some random cool stuff I've noticed lately. Closer to home, Mona Molarsky of the New York Examiner website continues her series on Favorite Bookstore of New York with the Upper East Side (that's Corner Bookstore, Archivia, and Crawford Doyle if you're trying to get your bearings.) Check it out, then browse through the previous 7 articles in the series for an in-depth look at some of the city's best. I recommend the Village and SoHo, naturally. Someday I should be so lucky. A Nova Scotia book club, too big to continue meeting in homes, just went ahead and opened a private bar to hold book discussions. It's called Fables, and it's beautiful. Sigh. Can't wait to listen to this radio broadcast on genre fiction, featuring Michael Chabon, Richard Price, and Agatha Christie's grandson. I'm in kind of a genre mood right now; I'm reading and pondering G.K. Chesterton's The Man Who Knew Too Much, and looking forward to starting Berry's The Manual of Detection right after that. My awesome sister who works in Santa Barbara, possibly the most beautiful town in Southern California, sent me this article on the one thing the town lacks: strong indie bookstores. The piece is typically doom-and-gloom (the internet is killing the indies! ), but it does have a list of the few that are still around, an interesting interview with an indie internet entrepreneur, and a great quote from indie bookstore champion Roy Blount Jr.: “I'd say the more local and personal and informed a store is, the more it will provide what the Internet can't.” Right on, Roy (and thanks, Sarah). Okay, I'll end on that note -- too antsy to keep pasting links. Better do some yoga, then get back to work. Will update you soon, promise promise promise.